Callisto Quartet, from left: Eva Kennedy, Hannah Moses, Rachel Stenzel and Paul Aquilar. Photo by Mike Grittani. 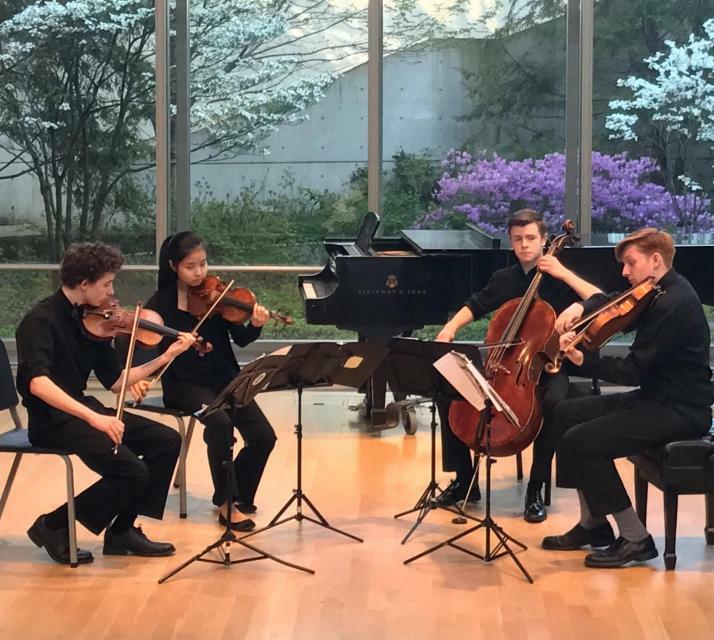 The Cleveland Institute of Music’s Callisto Quartet won the Grand Prize in the 2018 Fischoff Competition on May 13, 2018. The Fischoff is the largest chamber music competition in the United States and the longest consecutively running competition. Each year approximately 125 chamber music ensembles of three to six performers enter this exalted and influential competition. The Callisto Quartet – comprised of violinists Paul Aguilar and Rachel Stenzel, violist Eva Kennedy and cellist Hannah Moses – also won the Senior Strings Division in the competition; they are coached by Si-Yan Darren Li and Peter Salaff. As Grand Prize winners, the quartet receives a cash prize, as well as an American concert tour and appearances at the Emilia Romagna Festival in Italy. The Razumovsky Quartet from CIM’s elite Young Artist Program for musically gifted high school students won the silver medal in the Junior Division of the Fischoff. The Razumovsky Quartet is comprised of violinists Phoenix Avalon and Hana Chang, violist Samuel Rosenthal and cellist James Hettinga. They are coached by Annie Fullard and Si-Yan Darren Li, both of the Cavani Quartet. The Callisto Quartet competed at the prestigious Wigmore Hall International String Quartet Competition in 2018, and they are the only American quartet that has been invited to participate in the Melbourne International Chamber Music Competition this summer. They were formed at CIM and have been playing together for only two years. Both the Callisto and Razumovsky Quartets are mentored by Director of String Chamber Music Studies Peter Salaff and the Cavani Quartet, comprised of Annie Fullard, Mari Sato, Eric Wong and Si-Yan Darren Li. Individually, Aguilar and Avalon study with Jaime Laredo and Jan Sloman; Stenzel with Stephen Rose and Jan Sloman; Chang with Ivan Zenaty; Kennedy with Lynne Ramsey; Rosenthal with Jeffrey Irvine; and Moses and Hettinga with Melissa Kraut.